A Markham home builder loan for a single family dwelling or for a number of units can be supplied by one our bank, institutional, or private mortgage lending sources. For self build construction projects, institutional home builder loans typically require that there is no pre-existing mortgage on the property as its very difficult to get the numbers to work on a second mortgage position. Bank or institutional lenders will also require that the borrower or builder qualify for a long term take out mortgage before commencement of construction. Basically, the borrower needs to qualify for the builder loan and long term mortgage at the same time as institutional lenders will not provide single family construction loans unless they can gain access to the more profitable long term residential property mortgage. The other key consideration when dealing with single family self build loans is management of the draw schedule. Typically the first draw is the hardest to get in place and its not uncommon for there to be draw cut backs and/or delays during the project due to the very specific administration institutional lenders are required to follow. As a result, there are a lot of self build construction projects that are funded by private mortgage lenders which tend to provide approvals faster, not require the take out mortgage to be approved in advance, and have more predictable draw processes on average. For builders and developers, home builder loans are focused on the value of the property before and after construction as well as the pre sales for the units being built. If homes are being constructed for inventory for speculative sale in the future, the amount of financing that can be secured against the property will be lower than in a pre sale situation due to the higher risk to the lender. Both institutional and private lending sources will require presales for most builder or developer loans related to residential home construction. Consistent with cheaper forms of money, the banks will have higher thresholds to meet than a private lender on average, making this type of financing more difficult to acquire at times. 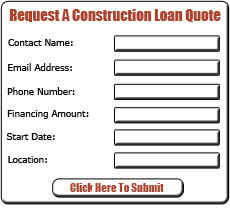 If you need a Markham home builder loan, I suggest that you give me a call so I can quickly assess your requirements and provide you with home builder loan options for your immediate consideration.